I started this review in December 2013, and am just finally delivering it now. Maybe Food and Fire, in Johnson City, is just too big to fit into one year? So full disclosure, a friend of mine, Dan, is one of the owners of Food and Fire. That always complicates my job, but he knows I pull no punches and that I'm always on the side of the small business owner, even if my opinion has some tough love mixed in. On my first trip to Food and Fire, way back in winter 2013, we were seated right away, but unfortunately, at a table which no servers were covering at that time. So we had an egregious lag time before we could manage to flag down a waitress and score some grub. I'm happy to report that on successive visits, the service kinks have all been worked out, and in fact, the wait staff in both the dining room and bar have been really warm, fun, and prompt. The interior is very Guy Fieri's "Big Bite," all black and red with chrome touches. It's macho, but not too sparse, and there are some very modern fireplaces to warm it all up and make it comfortable for the female persuasion. 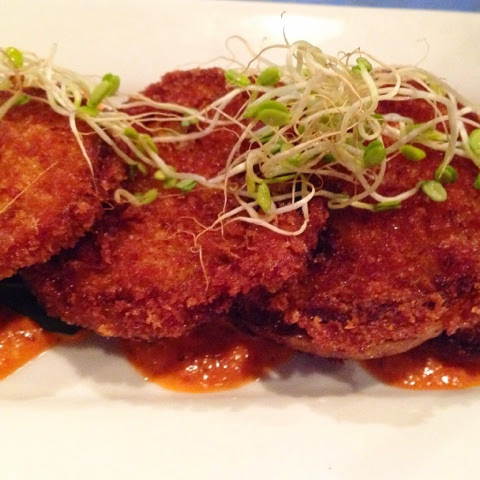 Back then, I wasn't bowled over by the under-seasoned fried green tomatoes, but when I ordered them again about a month ago, they could have won an award for most improved. The breading is super crunchy and the green tomatoes are tart and hold together well. The red pepper sauce served alongside is reminiscent of a romesco sauce: sweet, creamy, and just a little nutty. The two best appetizers on F&F's menu are like the proverbial angel and devil, warring atop each shoulder for your attention. The smoke bombs are fiery and fantastic. Hoo boy! 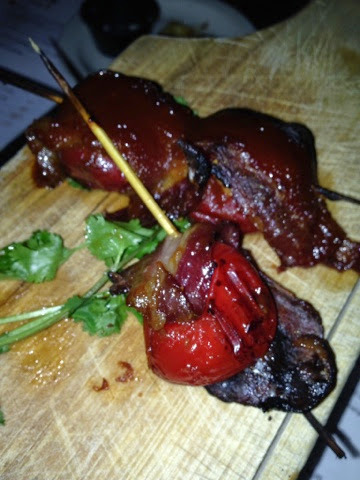 The jalapeño in this popper play is smoked to crisp-tender, and just like all chiles, will vary in heat. What I'm saying is, the bomb you pick off the plate could be hot, or it could be nuclear. You've been warned! The bacon wrapping the outside of the smoky, spicy chile and cooling, but flavorful, cream cheese somehow gets cooked through perfectly despite the jalapeños retaining some bite, and the saltiness plus a hint of sweetness from a quick swipe of BBQ sauce is much more successful in balancing the spice and cream than boring old breadcrumb coating. On the more angelic side, the sweet bombs are there to cool you down. These are sweet papadew peppers dolled up in much he same fashion, but bursting with sugary pleasure. No pain on this plate. The cream cheese here is fortified with cheddar, to bring some savory flavor to all that sweet. Another glaze of BBQ sauce and the light smokiness ensures these babies aren't all saccharine goo. 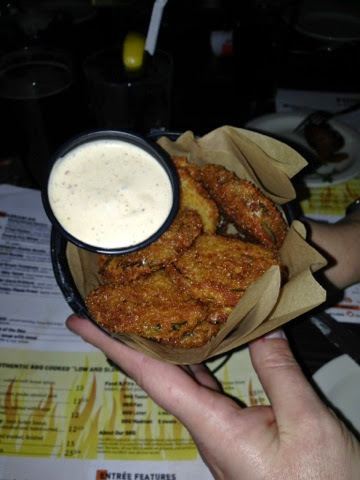 Fried pickles come dangerously close to my beloved and dearly departed most-favorite-ever fried pickles at The Peguin, in Charlotte, NC. For one thing, Food & Fire is one of the only joints north of the Madon Dixon using the proper dill chips instead of blasphemous spears. But better still, these are homemade pickles! Dip in ranch and shovel them into your gaping maw with abandon. They're yummy. Ok, so I know the focus and the star here is BBQ. Honestly, the BBQ at Food and Fire, for me, is not the star. I'm a tough judge on BBQ, to be sure, having lived for two years in rural North Carolina and spent a lot of time in Texas Hil Country. Something is going on with Food and Fire's rub that doesn't work for me - maybe a little too much brown sugar that over-caramelizes in the smoker or something similar. For my palate, that rub covers up the actual taste of whatever meat it's seasoning, and I lose the flavors of salt and fat that for me equal good BBQ. But I only have the one mouth with which to taste, and this is where the lesson comes in, folks. I have eaten F&F's BBQ with plenty of people who totally groove on the pulled pork, ribs, and chicken wings all rubbed up good. And that's kind of the genius of this restaurant - I love eating there even though their BBQ is not my jam. So what does make my skirt fly up at Food and Fire? Why, it's only my new favorite burger in all of the Southern Tier, the glorious rise and swine burger. I mean, come on, throw a sunny side up egg, a little smoky ham, and some smoked Gouda cheese on anything and I'm likely to chow down, but add them as the crowning glory to a juicy, thick, beefy burger? Oh, and have the eggy bun actually be capable of containing all this gustatory gladness? This is the stuff that hangovers and hungry mornings spent volunteering are made of, friends. 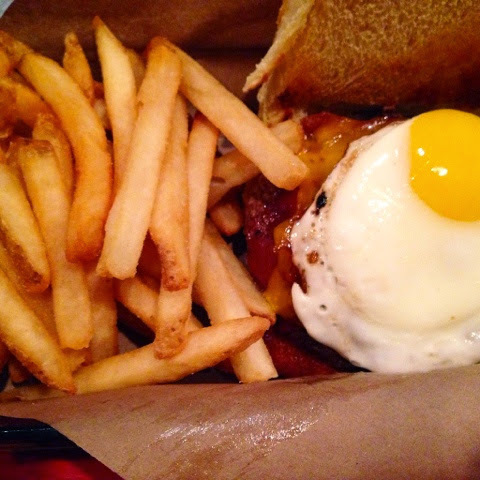 In the Bingamton area, we're a little shy on really good pub grub spots. You all know I love Zona in downtown Binghamton, but it's tiny, and from where I live, a bit far away. 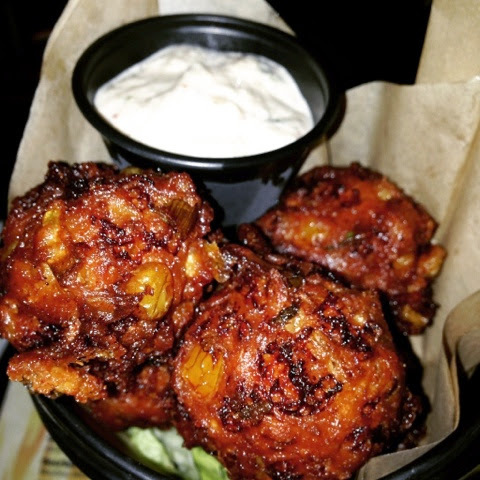 I love that Food and Fire has pretty fantastic and creative appetizers and good burgers, plus sandwiches, salads, and the whole BBQ array - in a comfortable setting that's large enough to always have a table available. And I haven't even mentioned all the craft beers, which aren't necessarily my thing, but offer a lot of options for those who love the hops. I give Food and Fire BBQ and Taphouse a seven on the BHS scale, maybe just for the fact that they serve a small cup of melted marshmallow fluff with their sweet potato cottage fries. Or maybe because I've been craving that burger ever since I ate it, or because the cute bartender is so tall? He can reach across a whole section of the multitudes of taps, almost! Or maybe because I think we need more Food and Fires 'round these parts, roomy restaurants where you can assemble a mess of friends and family and share some down to earth and artfully prepared food - and there's something for everyone. How delicious does that sound? My personality is big; my hunger is bigger! I am wicked hungry now!!!!! Especially since I did not break the fast yet!! !